Within the Price Systems there is a Tax Management component to deal with all sorts of taxes. So it is possible to calculate and print out taxes as needed. The Tax Management is quite transparent and should not affect the system very deeply. As a result - if not necessary (e.g. because you have a B2B system, etc.) - you don't need to deal with taxes in E-Commerce Framework at all. Also, if you have your very own tax implementation, this should be perfectly possible and you should need to not deal with the Tax Management in the E-Commerce Framework at all. Just use all the default values and every thing should be fine. The configuration of taxes is done with OnlineShopTaxClass Pimcore objects within in the Pimcore Backend UI. The actual tax calculation is always based on the configuration of such a tax class. So, tax configurations for different countries and product groups can be established. The tax calculation is always based on one tax class, a combination of tax classes is not possible. The configuration concludes a TaxEntryCombinationMode (combine and one after another) and one or more tax entries with a name and a tax rate in percent. The selection of the correct tax class (for a certain country and a certain product group) is done by the Price System (see next section). getTaxClassForProduct: Should return tax class for given product. The default implementation returns a generic tax class based on the Website Settings or - if not set - an empty tax class. getTaxClassForPriceModification: See later for more information. The logic behind the tax class selection can be of any complexity. It can be based on a simple Website Setting (for one tax class fits all), or based on a complex matrix with product group, sending country, delivering country and several other aspects. The actual tax calculation is done in the TaxCalculationService::updateTaxes(IPrice $price, $calculationMode = self::CALCULATION_FROM_NET) method. It updates taxes in given price object by using its tax entries, tax combination mode and net or gross amount based on the given $calculationMode. By IPrice objects when setAmount, setGrossAmount or setNetAmount is called and $recalc is set to true. getTaxEntries(), setTaxEntries($taxEntries): Sets and gets tax entries for price. Each price can have one or more tax entries based on the tax laws. Each of these tax entries contain percent rate and calculated amount. The order of the tax entries is important. TaxEntry::CALCULATION_MODE_COMBINE: Sum up all tax rates and calculate tax amount afterwards. 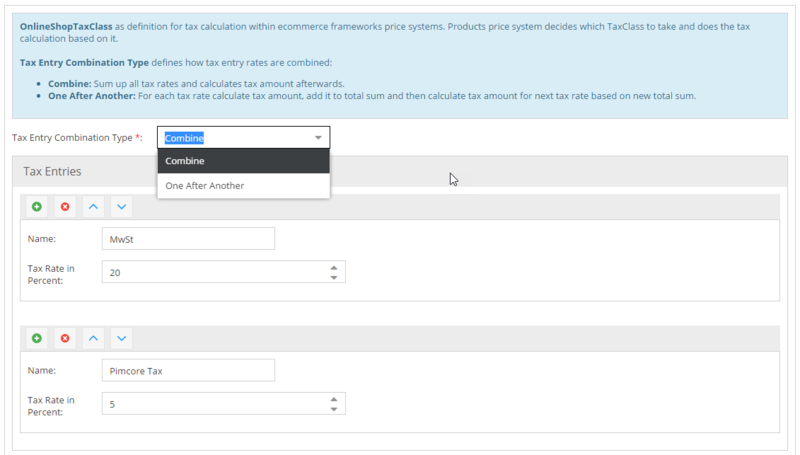 TaxEntry::CALCULATION_MODE_ONE_AFTER_ANOTHER: For each tax rate calculate tax amount, add it to total price and then calculate tax amount for next tax rate based on new total sum. TaxEntry::CALCULATION_MODE_FIXED: Amounts and percent rates are fixed and cannot be (re)calculated based on information within the IPrice object. This mode is needed for subTotal and grandTotal in CartPriceCalculator. getGrossAmount(), setGrossAmount($grossAmount, $recalc = false): Sets and gets gross amount of price. If $recalc is set to true, corresponding net price is calculated based on tax entries and tax entry combination mode. getNetAmount(), setNetAmount($netAmount, $recalc = false): Sets and gets net amount of price. If $recalc is set to true, corresponding gross price is calculated based on tax entries and tax entry combination mode. getAmount(), setAmount($amount, $priceMode = self::PRICE_MODE_GROSS, $recalc = false): Gets the gross amount by default and sets the gross or net amount based on the params. E-Commerce Framework Pricing Rules always modify the gross price of the product and recalculate the net price based on the tax entries of the product price. So specified discount amounts on product level need to be configured as gross discounts. Since cart discounts are implemented as CartPriceModificators the next point is important for them. It might be necessary to extend the default implementation of the cart discounts for the correct selection of the tax class for discounts. The default implementation uses the getTaxClassForPriceModification method of the Price System called default for tax class selection. The CartPriceModificators themselves can decide if the modification should be done as net or gross amount since the interface IModificatedPrice extends IPrice and therefore all tax related information as explained above. The method getTaxClassForPriceModification in Price Systems can be used to delegate the tax class selection to Price Systems. For setting up the tax management, following steps are necessary. Create and configure all the OnlineShopTaxClass objects within Pimcore. Setup the correct price systems and implement their methods getTaxClassForProduct and getTaxClassForPriceModification. It might also be necessary to have a look at the CartPriceModificator for cart discounts and make sure that it selects the correct tax class. Make sure that all tax related attributes are available in OnlineShopOrder and OnlineShopOrderItem. Then the E-Commerce Framework populates all needed values automatically and therefore stores the tax information in the order objects.